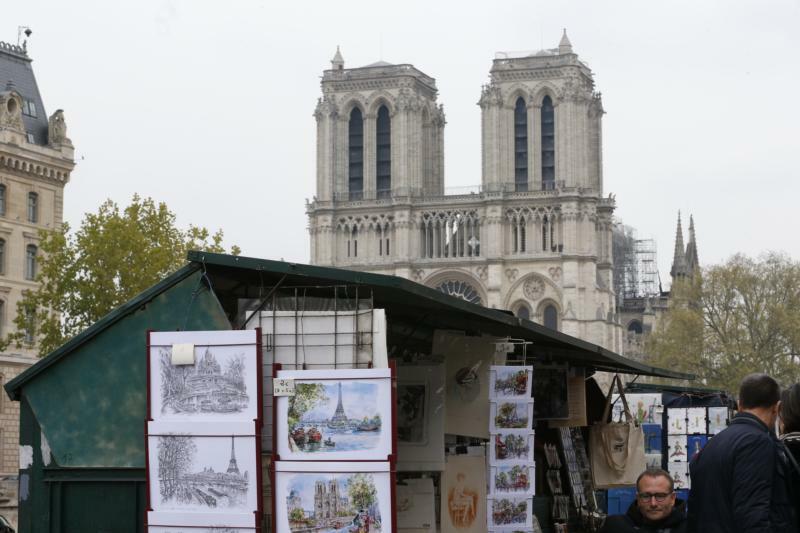 PARIS (CNS) — Church leaders joined government officials in saying they expect that Notre Dame Cathedral’s grandeur will be restored as firefighters extinguished the last flames of a fast-moving blaze that seriously damaged much of the iconic structure. “We are living through an extreme moment. This is Holy Week and it isn’t an accident,” Paris Archbishop Michel Aupetit said outside of the 850-year-old historic structure late April 15 as firefighters continued to attack the flames. “Having marked the Passion of our Lord Jesus Christ, we are now experiencing our own passion, but we know that after it will come the resurrection. We believe in this and we will proclaim it by rebuilding this cathedral,” Archbishop Aupetit said. French President Emmanuel Macron praised the “extreme courage and great professionalism” of first responders who helped save the facade and towers of the Gothic landmark. He announced that a national reconstruction fund would be established. Speaking in front of the charred cathedral late April 15, Macron said he understood the feelings of French Catholics in face of the disaster and pledged the whole population would “stand with them” in restoring it. “Notre Dame de Paris is our history, our literature, our imagination, the place where we have experienced our great moments, the epicenter of our life,” said Macron, who was accompanied by the archbishop, French Prime Minister Edouard Philippe, and Paris Mayor Anne Hidalgo. “We built this cathedral over centuries, raising it up and improving it, and I now state solemnly that we will, all of us together, reconstruct it. This is undoubtedly part of the French destiny,” Macron said. Up to 500 firefighters battled for 15 hours to save the cathedral after flames erupted in the structure’s attic about 6:30 p.m. local time. The blaze quickly consumed two-thirds of the 13th-century oak roof and brought down the cathedral’s 300-foot spire. Authorities said much of the cathedral’s wooden interior was destroyed and its masonry was seriously scorched. Rescue teams formed a human chain to remove many of the cathedral’s priceless artworks and sacred objects, including the crown of thorns relic from Jesus’ crucifixion and a gold tunic of St. Louis, the report said. Meanwhile, offers of support in rebuilding the cathedral, a UNESCO World Heritage site, came from church leaders and governments around the world, including Donald Tusk, European Council president, who said April 16 that he hoped the European Union’s 28 member-states would all help share the costs. He explained how the disaster had stirred “deep emotions” throughout France, adding that he had received messages of sympathy from faith leaders worldwide, including many Muslims. The newly elected president of the French bishops’ conference, Bishop Eric Moulin-Beaufort of Reims, told the Famille Chretienne weekly 16 the cathedral also represented “national unity during all tests,” and would be “an immense loss” to the whole world. “Something from the best of humanity went up in flames yesterday evening, and I sense a large part of humanity is in communion with our grief,” Bishop Moulin-Beaufort said. “But cathedral edifices have been burned before and every time they’ve been rebuilt even more beautifully. So I see in this tragedy the occasion for a national restart and a sign of resurrection for the whole nation,” he said. He added that there was no news as yet about the state of the cathedral’s historic 8,000-pipe 18th-century organ, but said he still hoped it could be preserved after lengthy repairs.